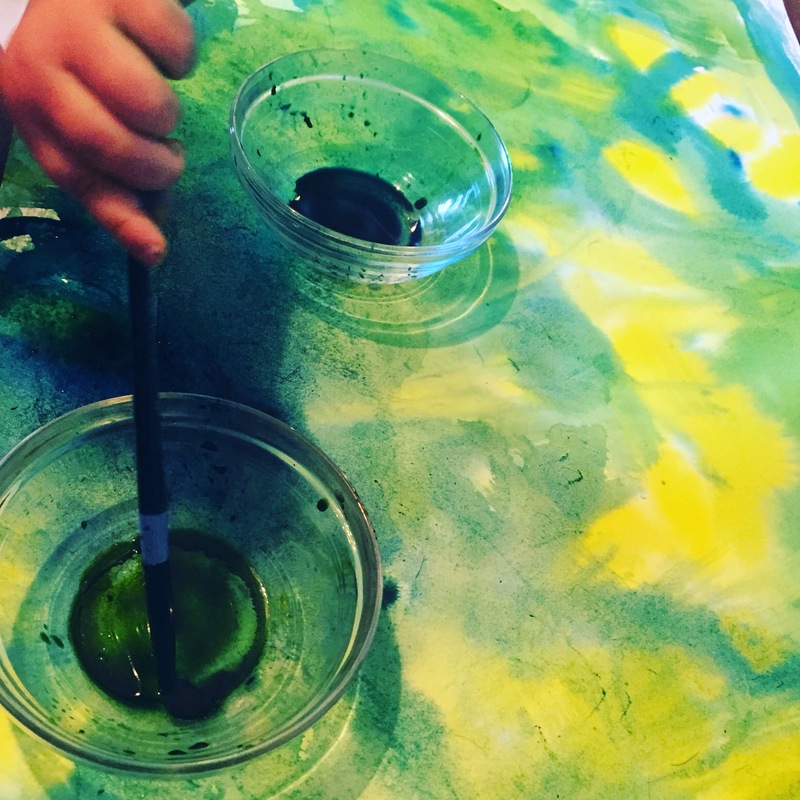 Wet on wet watercolors is an art form commonly associated with Waldorf education. It’s also a perfect introduction to painting. 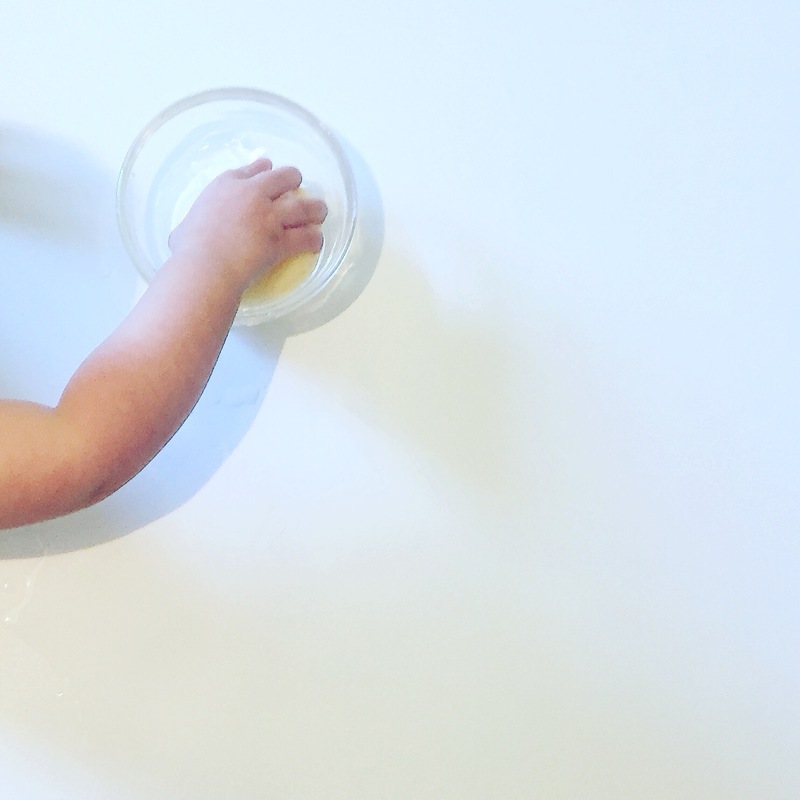 Kai is 18 months old and just ready to paint with a brush (and her hands). First I showed Kai how to wet the paper with the sponge. If you have a younger toddler this might be enough activity in and of itself. Kai loved it! This is why you want actual watercolor paper: it needs to be tough enough to get thoroughly wet. Once the paper was damp I provided a child sized paint brush and bowls with blue and yellow paint. Why two colors? 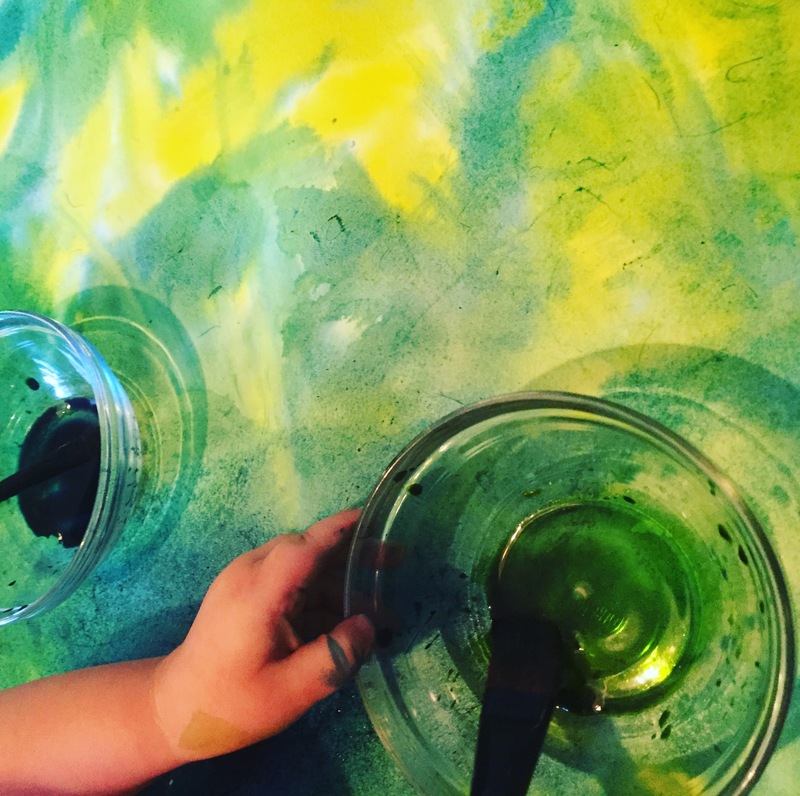 If you pick two colors your kid can experiment with color mixing without ending up with a muddy brown mess. 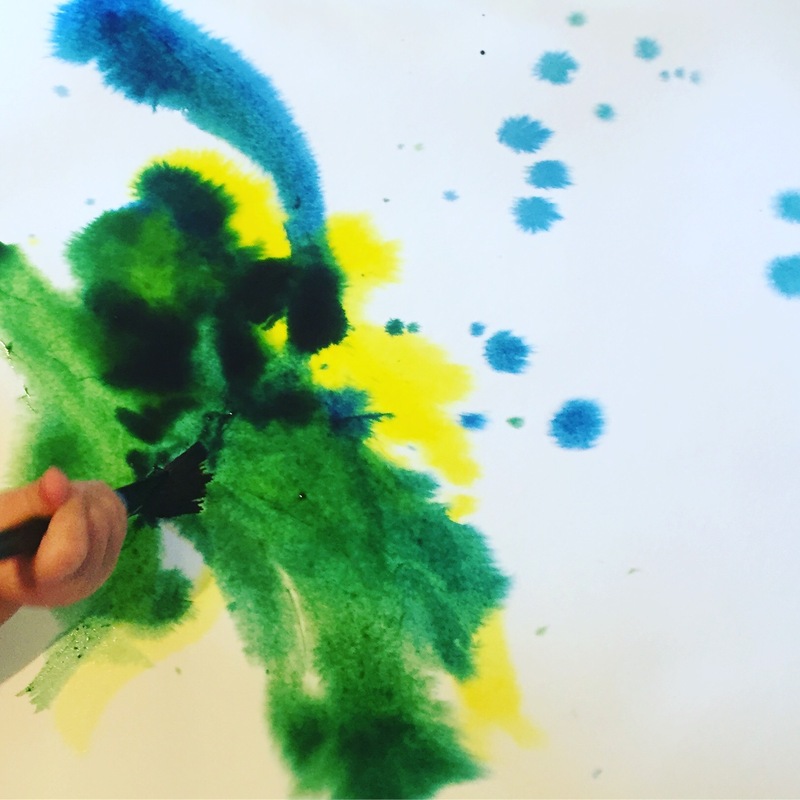 They can use different methods of getting the paint on the paper, where and how the colors touch and overlap, and if you start with two primary colors, they’ll end up with a secondary color no matter how much they mix the paints. This is especially pretty in wet on wet water coloring because the wet paper lets the paint glide over the surface and gently mix with what was already there. A Waldorf teacher once told me that they encouraged the kids to fill the page all the way to the edge, which is beautiful when it comes to wet on wet watercolors. It also meant that I was prepared for paint to go off the edge of the paper and I didn’t feel the need to say no or get nervous when Kai got close to the edges. The table was protected and that was what she was supposed to do. I also let her paint on the other side of the paper after it’s dry since watercolor paper is so expensive. She did get quiet a bit of paint on herself, but thankfully it washed off quickly and easily. We’ve done this a couple times now, and it must be fun, because Kai knows where the paints are stored and she’ll sign want and then do a little happy dance when she sees that I’m getting them out. For the next attempt, I found a picture of ocean waves as a provocation since its beach season here, now. We’re going to try blue and green paint and see what happens! This post contains affiliate links for your convenience and to help keep the blog going.